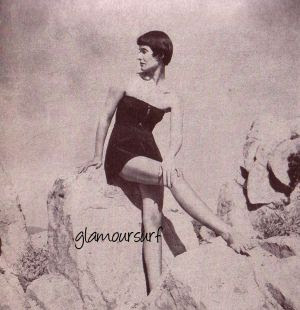 We continue in our 1950 Beach Wardrobe series with a looks at the Polka Dot Tube, the Bathing Dress, the White Shell, the Bathing Sheath and the Beach Maillot in Velvet. The Polka Dot Tube, one piece bathing suit, with swathing across the torso, in a color to compliment a tan - bronze, with golden coin dots. A Howard Greer design for Caltex in Hafner rayon satin with Lastex; $23. from Henri Bendel. The Bathing Dress, the perennial dressmaker, here, strapless, with a narrow latticed front slit, a sash at the back. By Bantner, in navy blue rayon faille with Lanton, $16; Best's. The White Shell, a lesson in design for action, with elasticized diaphragm and adjustable straps. By Jantzen in white rayon and cotton sharkskin with lastex, $13; Best's. 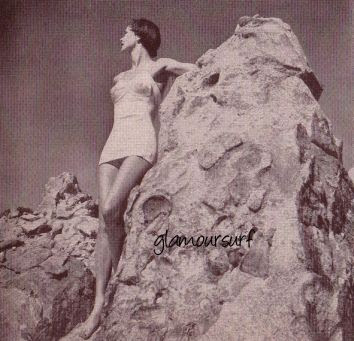 The Bathing Sheath, strapless with a molded bodice, smooth skirt across the front. By Mabs of Hollywood, white rayon sharkskin with Lastex, $12; Franklin Simon. The Beach Maillot - In Velvet, bright blue with a plane of shirring at the front, straps to wear or not. By Cole of California in Crompton silk velvet, with an underlining of cotton jersey, $18; from Altman. 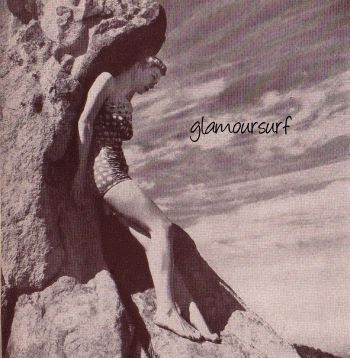 Our 1950 Beach Wardrobe series will conclude tomorrow. Stay tuned!